Every painting has it's challenges. Mostly just trying to simplify and focus on what it is you want the viewer to get excited about. 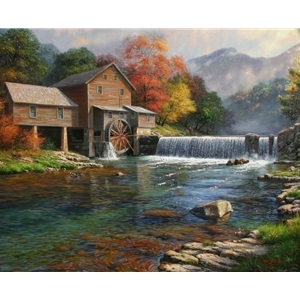 When asked to paint the Old Mill in Pigeon Forge I was immediately taken with the setting. I loved how a person could disappear from the hustle of the small town and it's ever present traffic and find a refuge among this historic setting. The challenge, however, was that I didn't know what it was that would "grab" the viewer and make them want to sit for a while. With a blank canvas waiting on my easel, I laid awake last night wondering how I would "pull this one off" and make it special. Then it hit me. The River, the way I paint water is one of my forte's. I can make the water so special that it wouldn't matter what else was going on in the scene." Click here to see Mark's work on The Old Mill in its various stages.